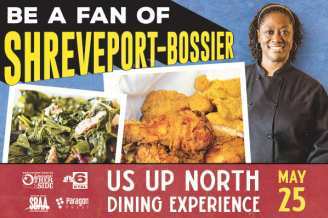 Join Chef Hardette Harris as she shows off the wonderful flavors of North Louisiana during one of her Us Up North Food Tours. Begin each tour by enjoying a sample of Chef Harris's famous greens and cornbread. Next, board a shuttle with Chef Harris and visit some of her favorite food spots, which will be serving up the best dishes that Shreveport-Bossier has to offer. Learn more at www.foodtourslouisiana.com. • Price: $65 per person for groups of 22 or less. $50 per guest if the tour is sold out.